Show it in action! If it’s about an activity (sport, gardening, dancing etc.) then have somebody ready to demonstrate the activity – like Ramsey did here with their mobile skate park. 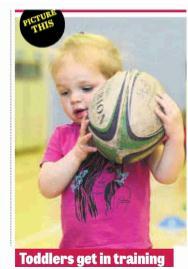 Or like Dewsbury Moor did here with their mini-rugby. Show who’s involved. If there’s a group involved make sure everyone can turn up. That way the photos will show the kinds of people involved in Big Local, and we’re sure everyone in this photo from Rastrick went and told their friends and family to read the article too. Have good quality images of your Big Local logo to give out so it can be featured alongside any photos – like Whitley Bay do here. Logos are good for making text look more interesting. Putting your Big Local stamp on it also gives people something for people to recognise. Names, ages, and roles. Where you have lots of people locally all willing to have their photo taken then make sure you have all their details to hand – names, ages, how they are connected to Big Local. This Kent newspaper used lots of photos from a mobile farm visit arranged by Chatham Big Local to provide free activities for children and families. But for every photo the newspaper will have needed names, ages and a bit of background (plus photo consent too). Use the best camera you have, and the person best at using it! …and if someone doesn’t want their photo for whatever reason then don’t take it. They can always get involved by taking the photos instead!